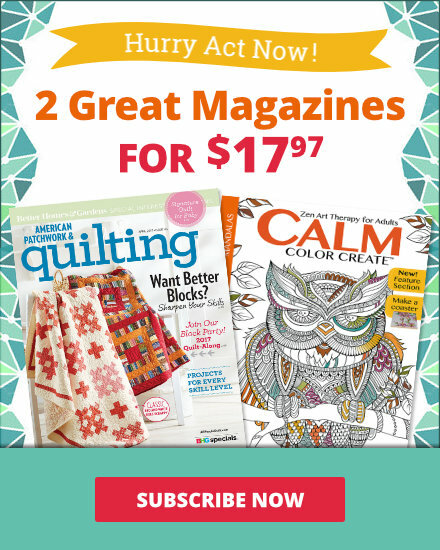 We know you love the projects printed in Quilts and MoreT. We took inspiration from the magazine and created Web-exclusive projects. A tumbler shape template is key to creating a cheerful small throw that’s sure to brighten up any room. Watch Hello, Yellow shift from trendy to traditional when made in a medley of red and blue prints from Bonnie Blue Basics by Paula Barnes for Marcus Fabrics. Quilt tester Jan Ragaller added a cool blue border that puts the focus on the quilt center. Click here to download instructions needed to make this throw. Turn Halloween-theme fat quarters and store-bought ribbon into pint-size goody bags to fill with yummy favors. Stumped over what to make from those irresistible fat quarters? Cut and stitch two 18x22-inch pieces into a quartet of mini totes. These wee gift bags made of prints from the Confections collection by Caleb Gray for Robert Kaufman Fabrics are topped with grosgrain ribbon handles. If you select a lightweight ribbon, purchase twice the amount and fuse or stitch two pieces together to achieve the necessary stability. Click here to download instructions needed to make these totes. Place your colors carefully and—bingo!—you’ve created a zigzag wall hanging from vertical rows of triangles. Soft and cuddly cotton flannels from the Baobab collection for RJR Fabrics turn Triangle Twist into a cozy baby quilt. This version uses an assortment of traditional baby colors in an arrangement that show of the zigzag motif especially well. 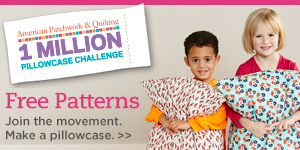 Click here to download instructions needed to make this baby quilt. Pull together eye-catching fabrics and a little rope to create a simple drawstring book bag with pockets aplenty. There’s no such thing as having too many totes—or too many book bags. Make this bag to complement a special outfit or to celebrate school colors. Fabrics are from The Big E Group for Michael Miller Fabrics. Click here to download instructions needed to make this bag. To make Flight of Geese resemble a day at the shore, replace the fabrics with an assortment of blue and green batiks. Quilt tester Jan Ragaller chose Ceylon, Key Lime, and Chamomile fat-quarter bundles from Hoffman California Fabrics to make a soothing square throw. Scan your fabric stash to make a quilt from a series of strips in solids and prints. Showcase stunning quilted motifs in the supersize border. Choose an allover print for the borders on a seasonal version of Bar Code and the assorted fall-tone strips take center stage. Executive Editor Jennifer Keltner chose Ravenwood by Jo Morton for Andover Fabrics for the border fabrics; the prints are from a variety of other Jo Morton collections. 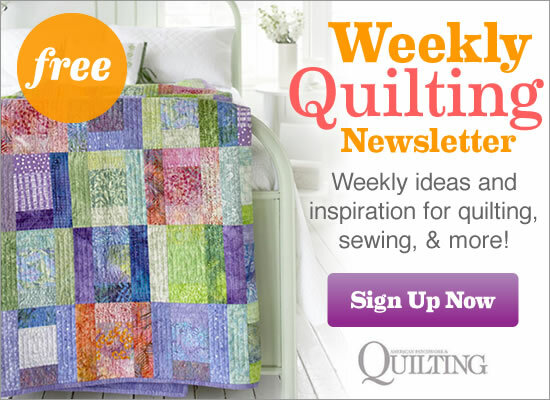 Click here to download instructions needed to make this bed quilt. Pull-up straps and a roomy interior make an easy-to-piece bag a go-to carryall. Give It’s a Cinch autumn flair with decidedly orange Petalicious prints by Nancy Thias for Marcus Fabrics. Project tested Judy Sams Sohn spiced up her rendition by choosing prints with a dash of teal and green. Click here to download instructions needed to make this tote. Sweeten your morning jolt with a coffee-cup cozy in your chose of three delicious varieties. Protect your hands from coffee-cup heat with a wrap-around cozy stitched in style from theme prints from the Coffee Buzz collection by Kathy Hall for Andover Fabrics. Click here to download instructions needed to make the coffee cozy trio. Fashion expandable fabric pockets into a handy hanging organizer. The best part? No appliqué required—these stylish ensembles are from printed panels. Perfect for the sewing room, this version of Dressed to Impress adds style and storage. A fussy-cut panel section from the Mrs. Sew & Sew collection by Dan Morris for RJR Fabrics is centered on the front of each of the dozen storage pockets. Click here to download instructions needed to make this wall hanging. Sumptuous silk taffeta is the crowning glory of an easy-to-piece table runner. Never sewn silk? Learn how simple it is. A bevy of black-and-white prints add a touch of sass to an quick-to-sew table runner. Start each block with an 8-1/2” square fussy-cut from a panel print and add 4-1/2”-wide strips to finish. Add more playful prints from Word Play by Michele D’Amore for Benartex for the setting triangles, border, and binding. Click here to download instructions needed to make this table runner. 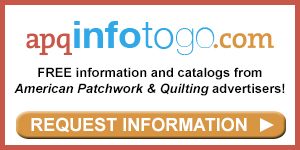 Do you want complete instructions for all the projects featured in the magazine? 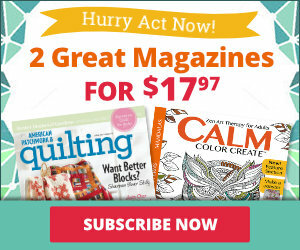 Purchase a copy of Quilts and More online, at your local quilt shop, or on newsstands.